Tooting Arts Club’s production of the Sondheim masterpiece, originally staged in a real-life pie and mash shop in Tooting last year (pictured above) transfers to a mash-up recreation of it on Shaftesbury Avenue, with press performances beginning on March 19 for which reviews will appear from March 23. 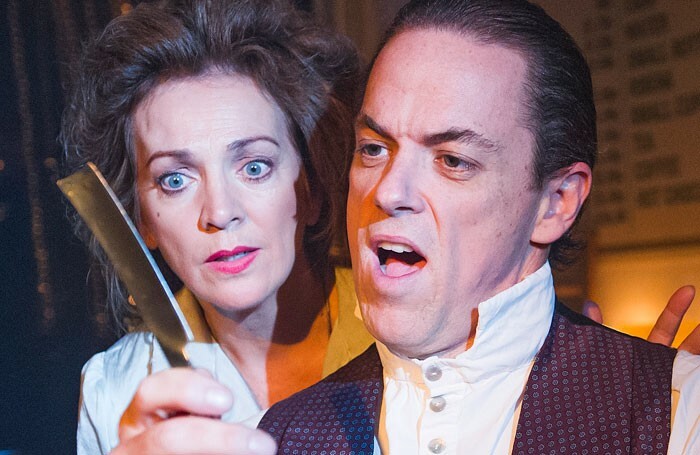 The cast is led by Jeremy Secomb in the title role with Siobhan McCarthy as Mrs Lovett. Also deservedly transferring is Joshua Harmon’s Bad Jews from the St James to re-open at the Arts on March 25, with the same superb cast that includes Jenna Augen (who won the UK Theatre Award for Best Supporting Performance for her role here when the play received its UK premiere at Bath’s Ustinov last year), Gina Bramhill, Joe Coen and Ilan Goodman (son of Henry). Pity that London Underground saw fit to ban their posters, though – somehow the title was deemed likely to cause offence. Also earning a welcome transfer from New York is Buyer and Cellar, a one-man play by Jonathan Tolins with its original star Michael Urie as an assistant in Barbra Streisand’s personal archive mall in her Malibu home, opening at the Menier Chocolate Factory on March 19. (There’s an interview with Urie in the March 19 issue of The Stage). Irvine Welsh’s Trainspotting returns to the London stage in a production directed by Greg Esplin opening at the King’s Head on March 20, that was first seen at last year’s Edinburgh Fringe. It is now 20 years since this stage version premiered, and it will be interesting to see how it holds up as what the website describes as an “immersive production that will transform the King’s Head Theatre like you’ve never experienced before”. Just around the corner Mike Bartlett’s Game is doing just that to the Almeida. Bryony Lavery’s play, originally seen in London at the National in 2002 where it starred an absolutely stunning Anita Dobson, returns in a new production to the Park Theatre, opening on March 19 with Ian Brown directing the usually splendid Helen Schlesinger. Unapologetically, I am a fan of Robert Holman. His is the name I most often offer when anybody asks me who my favourite living writer is… Holman has spent four decades now writing plays of quite startling beauty. The National has Sam Holcroft’s Rules for Living opening on March 24 in the Dorfman, directed by Marianne Elliott. When this play was first announced last year, there was an online clamour from some quarters about the lack of female voices being represented at the National – but some of the commentators didn’t realise that Sam is a woman. It takes huge imagination to be a scientist. You have to conceive experiments and hypotheses, and dream up scenarios in which your hypotheses might be tested. The only difference I struggle with is the fact that in science, there is often a right answer and a wrong answer. In theatre, of course, you’re never completely right and you’re never completely wrong. I’m a big fan of cabaret performance, and this week there are three I’d like to see. I’ll be at the London debut of New York-based songwriter Rob Rokicki at the Bridewell on March 20. Fellow composer Adam Gwon says that “Rob’s songs live at the perfect intersection of musical theatre and radio rock”. I’ll also be at the Pheasantry on March 22 for an appearance by the legendary Broadway composer Charles Strouse, whose amazing catalogue of shows includes Bye Bye Birdie and Annie. He’s there for three nights to March 24, and is joined by guest Bonnie Langford. What’s not to like? A fantastic cast that comprises Emma Williams, Eva Noblezada, Daniel Boys and German musical theatre star Anton Zetterholm come together to showcase the songs of Off-Broadway writer Ryan Scott Oliver at the St James Studio on March 23. Oliver’s shows include Jasper in Deadland, We Foxes, Mrs Sharp and 35MM: A Musical Exhibition. Regionally, Manchester’s Royal Exchange has Jo Clifford’s new adaptation of Tolstoy’s Anna Karenina, opening on March 24 in a co-production with West Yorkshire Playhouse were it plays next. Ellen McDougall, Olivier nominated for her 2010 production of Ivan and the Dogs seen at Soho Theatre and on tour, directs Ony Uhiara in the title role. Liverpool Everyman has Nick Bagnall directing a cast that includes Cynthia Erivo, Dean Nolan and Andrew Schofield in Shakespeare’s forever-fresh comedy, opening on March 25. Erivo, who appeared in the all-female Julius Caesar at the Donmar Warehouse, is headed to Broadway later this year to reprise her stunning Menier Chocolate Factory performance in The Color Purple. Catch her now before she becomes a huge star. Edinburgh’s Royal Lyceum, Amanda Gaughan directs Nicola Daley in the title role of Ibsen’s drama, opening on March 24.